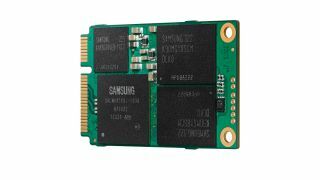 It looks like Ultrabooks will get a shot in the arm in 2014 as Samsung has revealed its new range of mini solid state drives (SSDs), including an industry first 1TB mSATA version - meaning big storage with a small footprint. Typically, only a larger 2.5-inch SSD would hold this much memory, with Ultrabook SSDs maxing out at 250GB. Announced in a company blog post, Samsung's dinky new 840 EVO mSATA SSD range, however, is available in 120GB, 250GB, 500GB and 1TB. What this is likely to mean is that next year's Ultrabooks could get a hefty memory boost without adding any size or weight to their dimensions. The 1TB drive has a thickness of 3.85 millimeters and a weight of 8.5 grams. Samsung says its read speed clocks in at 540MB/s, with write speeds at 520MB/s, putting it on a par with its bigger 2.5-inch brother. This should means that you will get desktop-levels of volume and performance on your ultra-slim notebooks. Despite being launched this month, you shouldn't expect a wave of new Evo powered Ultrabooks to swarm the market before Christmas as it will take time for manufacturers to adopt new technology.